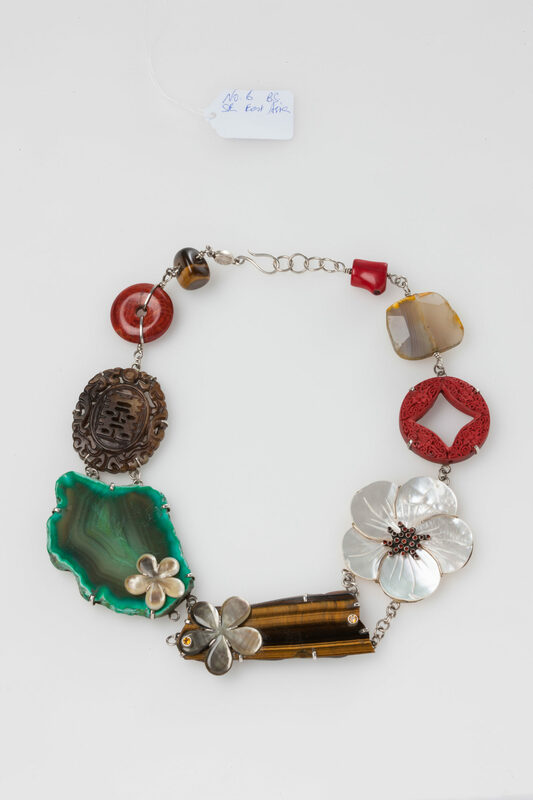 A large central slab of tiger eye is set with two smaller mother of pearl flowers highlighted with a small faceted citrine; linked to a large mother of pearl flower with a centre of small lively faceted red garnets. This is linked to a carved Chinese red lacquer ring; beside it is a chunk of grey/yellow agate. 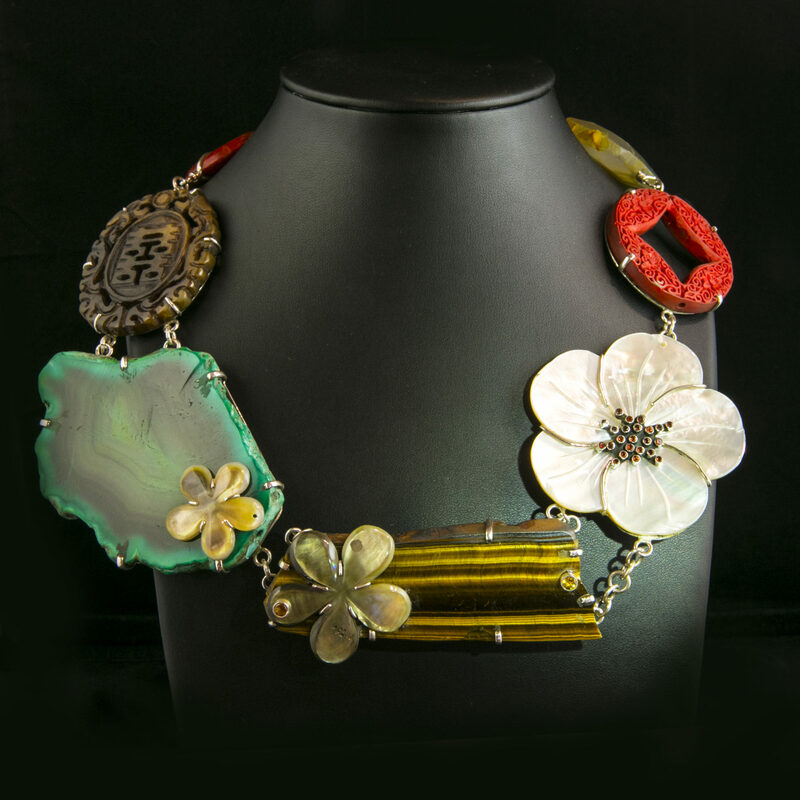 On the other side of the tiger-eye slab is a dyed green agate slab set with a second medium mother of pearl flower. Beside it is a carved brown stone. A tiger eye chunk completes the necklace – all set in sterling silver. It is a necklace that is both strong and feminine, all set in sterling silver. This necklace refers to the strong colours and shapes of tropical vegetation, gardens rocky outcrops of Jane Magon’s childhood memories in Port Moresby, Papua New Guinea. The two smaller Mother-of-Pearl flowers here are reminiscent of tropical Frangipani. This necklace refers to the tropical vegetation and gardens of my childhood memories in Port Moresby, Papua (PNG). The vegetation is strong, tough and often with brilliantly coloured leaves and flowers contrasting with rocky outcrops and rock walls. The two smaller Mother-of-Pearl flowers here are reminiscent of Frangipani – a white, pink or red tropical flower with lush yellow centres and strong scent. Brightly coloured tropical flowers were everywhere. This necklace reminds me of my childhood garden in Port Moresby. The tamarind tree with its’ large tropical leaves and generous branches (seen behind me in some photos) feature alongside mango and paw-paw trees as well as large tropical flowers. On some shots are the large, rippled leaves of the Monsterio Deliciosa. In the tropical heat and wet seasons the garden developed quickly so that it was very lush by the time I left Port Moresby at the age of ten. The polished, irregular agate and tiger-eye agate slabs and earthy and green colours reference the comparatively raw, wild quality of life there and the dangers inherent in the garden: snakes, spiders, and watching and worrying about bush-fires on the near-bye hills. The red Chinese lacquer ring references the Chinese people who also lived and worked In Papua New Guinea beside the local Indigenous people and the Caucasians of Australia, Europe or USA. The red lacquer ring also refers to the influence the Chinese have had throughout South East Asian cultures.